When Canadian musician Dave Carroll looked out the window of his United jet to see the workers flinging his guitar across the tarmac, he knew there was going to be some damage. Sure enough there was. But after months of being given the runaround, he realized his only weapon would be to write a song about it. "United Breaks Guitars" was the result and, even better, the video went viral on You Tube. But even that wasn't enough to get the lumbering behemoth of United's PR department moving into action. The excellent book, Real-Time Marketing and PR, details Dave's situation, commending him for his PR knack. He eventually got real-world results when United changed its customer-service policies, but not before the company's stock fell 10 percent in the week after the song was released. Further, Carroll owned a Taylor Guitar, and the owner of that company gave Carroll two new guitars. The company was adept at jumping in when the iron was hot to get a little positive PR of its own. 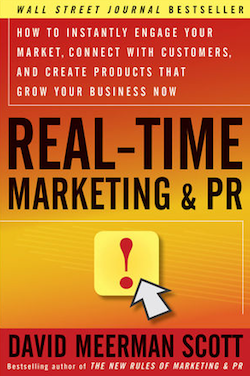 The whole point of the book, by David Meerman Scott, is that, in today's world, companies need to be ready at any moment to seize positive PR opportunities. Crisis communications can truly be the difference between a relevant operation, like Dave Carroll himself and Taylor Guitars, and one that seems to be fading, like United. Apparently, Delta has a PR problem also. When are airlines going to learn, eh, Anonymous? I'm flying on Frontier and US Air next week. Hopefully there will be no horror stories to report here. HostGator might be best-known for their common encouraging plans, yet they in like manner have a hostgator coupon noteworthy assurance of Virtual Private Server prepares for customers that require better execution and the ability to change their application setups. Preceding that, I ought to reveal to you that Vidmate EXE record not open to explicitly Install the application on Windows Computers or Laptops. Along these lines, VidmateApp Apk we have to find other working techniques. Hello, HostGator is offering upto 51% discount at HostGator India web hosting plans with a FREE Domain, unlimited hosting bandwidth with unlimited server space and 24x7 quick chat and phone support with 100% guarantee.